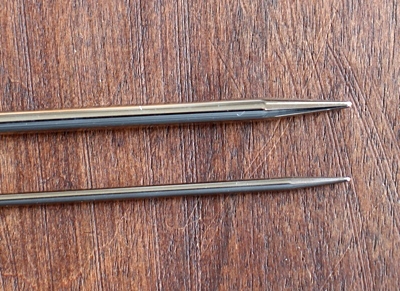 Addi Turbos are the Cadillac of nickel-plated brass circular knitting needles, setting a standard against which all others in the market compete. The needles are all made in Germany, to exacting specifications and in impeccable working conditions, and they all carry a lifetime warranty. Naturally, this comes at a premium cost, which has given rise to a host of lower-cost competitors. Over the years, Addi has played with its needle formula just a bit. They sharpened the tips to make Addi Lace circulars, and then they reengineered the cords to provide interchangeable Addi Clicks. All that time, however, the traditional Addi Turbo needle retained its telltale blunt tip. Those who loved the precision of the Lace but the slick nickel-plated brass surface of the Turbos? They were left out in the cold. Until now. Addi Turbo Rockets and Sock Rockets are essentially the same thing, just named differently depending on the needle size. Both offer the same perfectly precise, dare I say addictive pointy tip of the Lace—pointy enough to work a P3tog without breaking a sweat, yet not so pointy that they produce blisters or make grumpy TSA agents look twice. But they do so with the slick, nickel-plated brass Turbo finish. All but the smallest size have the translucent blue nylon cord you get in the Clicks. It’s flexible yet heavy enough to hold substantial projects without sagging. 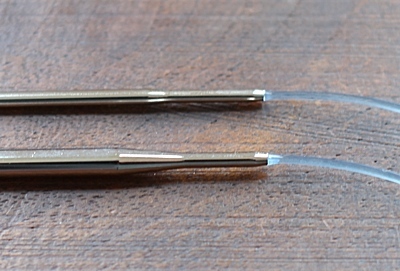 The smallest size has the gold cord you may have used in previous Addi needles. The join is perfectly smooth. Fans of swiveling cables will, however, be disappointed to note that the cable in Rockets and Sock Rockets is entirely fixed—no swivel. If your fingers naturally want to rotate your needles as they work, the cord will twist with them. I always say this, but it really is true: Knitting needles are very personal. Rather like writing instruments. I know some people who use nothing but mechanical pencils, others who are all about rollerballs. And some, the confusing few, don’t even notice what they’re using as long as it makes a mark. But if you do pay attention, you’ll notice that your handwriting can change depending on what you use. Some pens make your writing look gorgeous, others turn your perfectly legible script into the scrawl of a busy doctor. Some make your hands work harder for each line, others nearly leap out of your hand and do the writing for you. Needles work in much the same way. If you take time to play with several different needle types, from wooden to metal, circular to square, blunt to pointy tips alike, also playing with different yarns, different fiber blends, different weights, you will begin to discover just how vast the realm of possibility really is. Addi Turbo Rockets are the best needle Addi has made to date. That’s a big statement, I know. But if you like speed and precision, don’t need an interchangeable cord, and have about $20 to spare, I think you’ll agree.